We have the 2011 Silver Panda Coins from the China Mint and they are available in stock for a limited time, so order now. 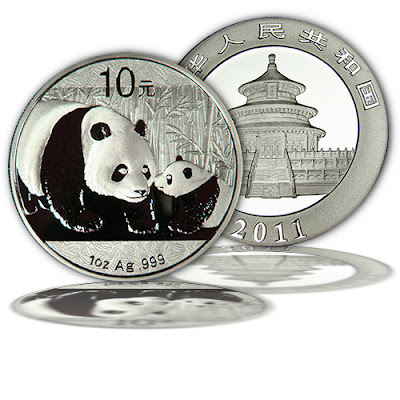 China Silver Pandas are some of the most popular silver coins in the world. These Silver Pandas are highly anticipated as their fresh, new design is released each year from the China Mint. China Silver Panda coins are some of the most beautiful and collectible Silver coins in the world. Each China Silver Panda coin is guaranteed to be in Gem Brilliant Uncirculated condition. The yearly design changes allow collectors to add variety to their collections from year to year and to accumulate one of the most beautiful series of Silver world coins. Panda Silver coins display a fresh, original design each year. 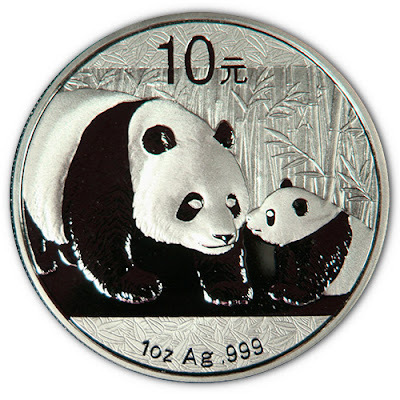 The 2011 coin features a mother playing with her cub in a field of bamboo. The reverse design is the same each year, representing an image of the honored “Temple of Heaven” in Beijing, and the 2011 date. We are always excited to see the annual design changes from the meticulous craftsmen at the China Mint. Each Panda Silver coin is beautifully crafted and feels like a miniature sculpture in your hands. Chinese Panda coins are genuine legal tender coins, issued exclusively by the People’s Bank of China. Each of the pure Silver Panda Coins is minted in one troy ounce of 99.9% fine silver. At very affordable prices, these coins make great gifts and are an excellent addition to any coin collection. Each Silver Panda comes double-sealed from the China Mint in a clear, protective package that surrounds a plastic holder. This keeps out effects of harmful air pollution and helps to preserve these beautiful coins for generations to come. These coins are really amazing i have never seen any where. Thanks for share i hope you will share more in future. Hi,i have read your whole blog,its very amazing,i am impressed.i have bookmark your site for revisit.if ever you need Lapel Pins then please contact me.Thanx dear.